Effective and ongoing collaboration is crucial to create a culture of excellence and achieve behaviors that result in peak performance. There is no way for ineffectual clinical partnerships to achieve these goals. 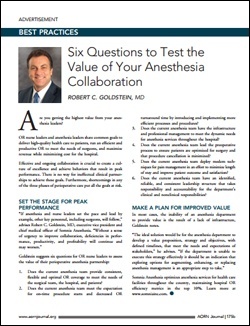 may worsen," and suggests six questions for OR nurse leaders to assess the value of their perioperative anesthesia partnership.